Touching the food culture of the other countries is a part of fun. 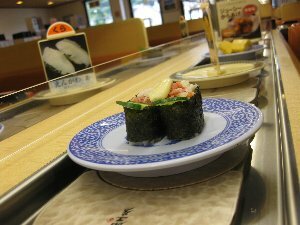 I think the highlight of this tour was conveyer-belt sushi. This time I took a man from America to Kiyomizu temple. Unfortunately that day was the day for school outing. We met elementary school kids everywhere we went. After walking from Kiyomizu temple to Yasaka shrine, we walked around Gion. Have you ever seen the movie "Memoirs of Geisha"? The story was the one of Gion. I explained the system of so-called Ochaya, Maiko and Geisha in front of the real Ochaya pointing at the wooden name plate of Geisha and Maiko. Then we went to Kazurasei which sells hair ornament for not only ordinary women but Maiko and Geisha. He chose one as a souvenir for his wife. It was a black one with a white flower. 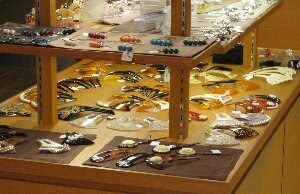 It was very beautiful and probably she will look good with it on and I hope so. Close to the shop, he found Japanese sweets shop. He got interested in the parfait served there. He decided to have pre-lunch. 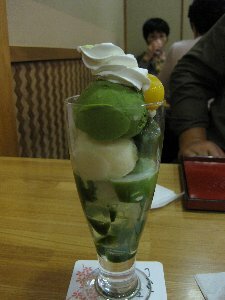 He had chesnuts parfait, and I had maccha parfait. We really enjoyed them and headed for Nishiki food market. Then we had .... soy-milk doughnuts. Yummmy! He said we didn't necessarily have lunch around noon, and we put it off later. 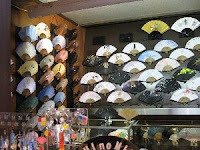 He got another souvenir for his wife, which is a Japanese fan. 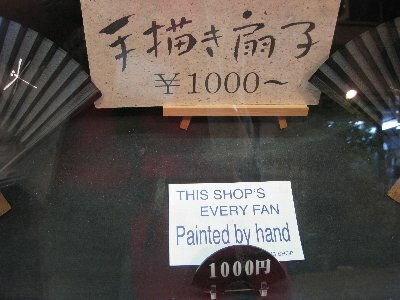 The shop at Nishiki market sells hand-painted fans. He chose a fan painted Japanese maple leaves. 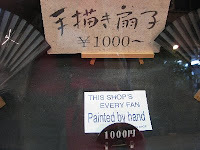 The red leaves were vivid on the black cloth of the fan. 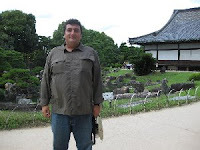 After visiting Nijo castle, we went to where he wanted to go. That is a conveyer-belt sushi restaurant. He had never seen one during his stay in Japan before we met. That was his first experience. I told him how the system worked. He seemed to really enjoyed it. That was the cheapest sushi he had ever had, and he said he didn't tell the difference between the ones he had before and the ones we had at that time. After visiting Golden Pavillion, where we met a lot of kids, we finised the tour.